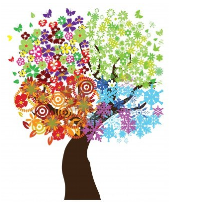 It's always the season to grow something wonderful at Putnam Valley PTA. No matter how much or little time you have, you can make a difference! You will find something to fit every interest, every schedule, and every season! If you should have any questions and would like to reach a PTA Committee Chair, please email us at info@PutnamValleyPTA.org. Volunteers are needed help our membership grow! This committe will man membership tabels at various events, maintain membership records, and plan exciting membership drives. 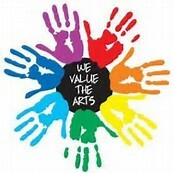 The Arts in Education Program is responsible for organizing school assemblies for the students to gain a broader perspective of a variety of cultural areas. This emcompasses musicians, poets, scientists, naturalists, and storytellers. Volunteers are needed to help the day of performances. 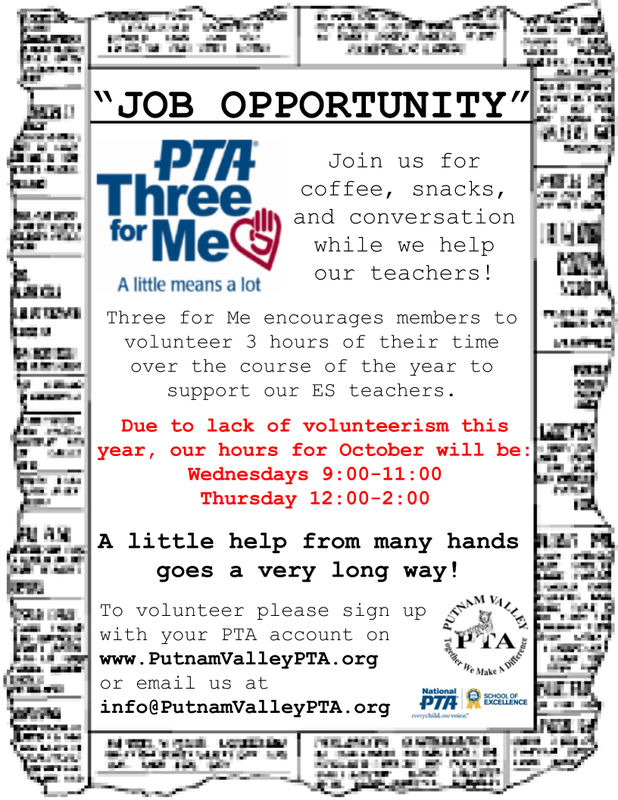 Please email us at info@PutnamValleyPTA.org for more information or if interested in volunteering for this committee. A parent to parent support and mentoring program. Looking to help become a resource for families and plan informational events. Sign up to be on this groups email chain for information, meetings and special events. In the event of a family illness, hospitalization or loss of a loved one. this committee could help coordinate providing meals, running small errands, and organizing needed donations. It is our hope that the need for this committee will not be great, and it is likely that we will call on you sporadically to see if you could make a meal or provide some sort of assistance. Please know that any help you can provide at any time throughout the year would be deeply appreciated. The PTA hosts grade level events for students in grades Kindergarten through 5th grade and their families. These events provide a fun, family oriented activity where parents and children can come together and get to know each other. Volunteers are needed to help shop for items needed, set up, emcee, help fascilitate and clean up for these themed events. Red Ribbon Week is an alcohol, tobacco and other drug and violence prevention awareness campaign observed annually in October . To end the week the PTA hosts games during the students lunch periods. Parents are needed to plan, organize, set up, facilitate, and clean up this event. In June to the PTA holds a BBQ and games for students and staff during lunch periods. Parents are needed to plan, organize, set up, facilitate, and clean up this event. 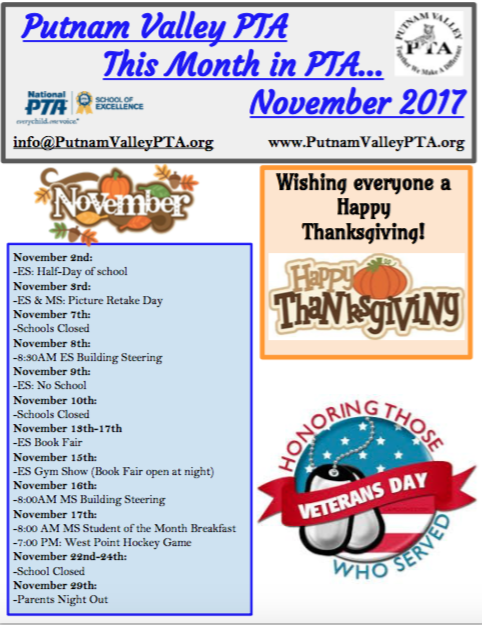 Please email us at info@PutnamValleyPTA.org for more information or if interested in volunteering for these events select the committee under the Volunteer tab. A little help from a lot of hands goes a very long way! !We would love to have you join our Three for Me Team! This program has been embraced by the teachers as it is of great assistance to them, is rewarding for parents, and enriches the student experience in the classroom. Among other things, parent volunteers photocopy, laminate, create reading logs, do prep work for classroom art projects and create posters. Please contribute any time you have during the school year. Any amount of time you can give is both welcomed and appreciated. A little goes a long way, an hour of your time is a huge help to our teachers and our children! Assistance in the organization of PTA ES School Picture Day. Volunteers are needed to assist in preparing mailings, assisting students on picture day, sorting pictures and compiling orders. Volunteers will also be needed for picture retake day. Please email us at info@PutnamValleyPTA.org if interested in volunteering for this event. Assistance in the organization of the PTA MS School Picture Day. Volunteers are needed to assist in preparing mailings, assisting students on picture day, sorting pictures and compiling orders. Volunteers will be needed for picture retake day as well. The Book Fair is a wonderful experience for all students. Each class visits the Book Fair at an appointed time during the week. The students have a chance to buy excellent quality books at reasonable prices. Volunteers are needed to help set up, advertise, and sell books to the students during the day and one evening. Volunteers interested in co chairing this event can work with the current team in the 2017/2018 school year. Please email us at info@PutnamValleyPTA.org for more information or if interested in volunteering for this this committee. The PTA Book Fair is a wonderful experience for all students. Each class visits the Book Fair at an appointed time during the week. The students have a chance to buy excellent quality books at reasonable prices. Volunteers are needed to help set up, advertise, and sell books to the students during the day and one evening. The yearbook is a photographic record of your child's year in the Elementary School. Volunteers are needed to take digital pictures, collect artwork, and solicit advertisements and booster boxes. Please email us at info@PutnamValleyPTA.org for more information or interested involunteering for this committee. Also, please note that there is NOT a PTA Middle School Yearbook Committee. Help make reading fun for our kids, and families! Volunteers are needed to bring creative ideas to this program, a nationwide program which encourages parents and caregivers to set aside 15 minutes daily to read with their children. Committee members will help choose a fun, reading-related theme and coordinate activities – which will ideally reinforce the curriculum in some way. Several activities will be sponsored throughout the year. Activities may include PARP sponsored theme-days (Carry a Poem in Your Pocket Day, Book Swap Day) or an evening event (Cuddle Up With a Book) – committee members will help decide! Please email info@PutnamValleyPTA.org if interested in volunteering for this committee. This event is a beloved tradition for our PTA. Children are invited to celebrate literacy and the holdiay season with snacks, crafts, and games. Members of our community come and share their favorite holiday story with attendees. This event takes place in the Elementary School on a Saturday. Volunteers are needed to plan, shop for, set up, facilitate, and clean up this event. Middle and High School Student Volunteers will have the opportunity to earn Community Service Hours. The Special Person/ Grandparent Seuss Spectacular is part of PARP month at the Elementary School. Children are encouraged to spend time reading at home with their special person and then come celebrate their reading with games, crafts, and snacks. We want to make our 4th graders last year at PVES special and this committee is ready to do just that! Volunteers are needed to handle the Spirit T-shirt sale in the fall, plan the PTA 4th grade Celebration breakfast, and help out with refreshments at the moving up ceremony in June. This committee is responsible for introducing musical theater to our 3rd & 4th grade students by putting on a musical production at the Elementary School. This is an after school activity. Volunteers are needed to assist during rehearsals;correspondence with participants and their parents/guardians; rehearsal dismissals; costumes; set design and building; tickets, program booklets with booster ads, etc. The Spring Fundraiser is to be held in May. In the beginning stages of planning. It's expected to be a fun-filled day for all! Volunteers are needed to help organize and facilitate this event.for our 3rd and 4th graders.